Today is the day Dima will fly to Moscow in preparation for our arrival. We tried to convince our friend Irene [EE-Rain-Ney] Calatayud from Madrid, to meet us in Scandinavia earlier but she couldn’t, so since she has never been to Russia, she decided to meet us in Moscow. We woke up at 8 AM and I got up right away at 8:15 and got ready for Mass. 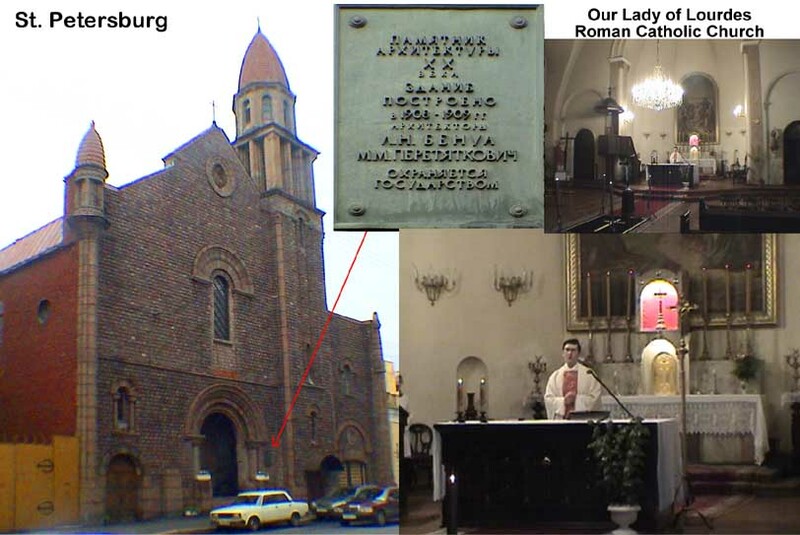 I had called Polina ten days ago requesting that she find a place for me for Sunday Mass in a Roman Catholic church. Since we would be on the train to Moscow all day Sunday, she chose Friday for me to go to Mass. Okay. 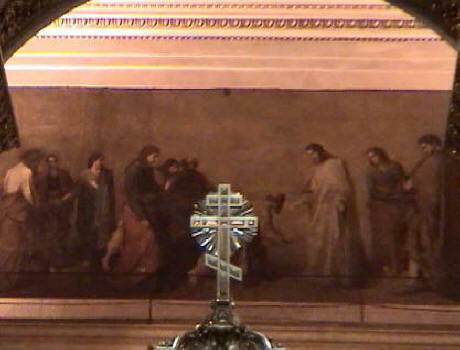 Polina picked me up at 9:00 AM and drove across town to a rare Roman Catholic church called Our Lady of Lourdes [, +7-.] 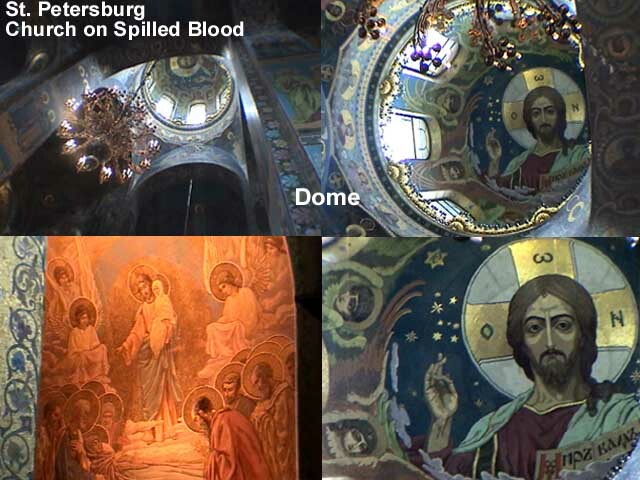 Russia is (or was - and becoming again) an Orthodox Catholic country and Roman Catholicism is not that widespread after 80 years of Communism. It was comforting to me that the Mass was the same as at home, except it was in Russian but there were only a very few people attending on a Friday morning. 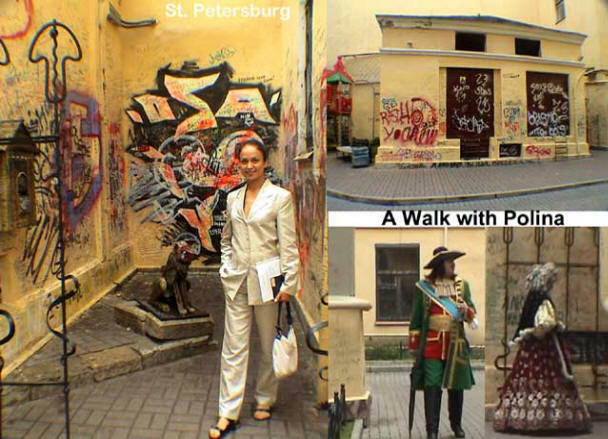 After Mass, Polina had to run some errands so I tagged along with her as we wandered the streets nearby. I kept looking for a cappuccino but we never found one. We did find some interesting graffiti and a period-costumed couple wandering around for what reason we didn’t know. 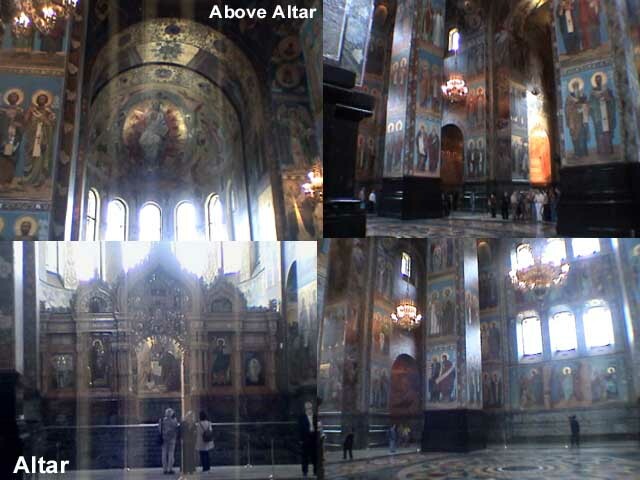 At 10:00 she took me to tour the Church of the Savior on Spilled Blood (Kram Spasa-na-Krovi) also known as “Church of the Resurrection of Christ” (Kram Voskressenia Kristova). 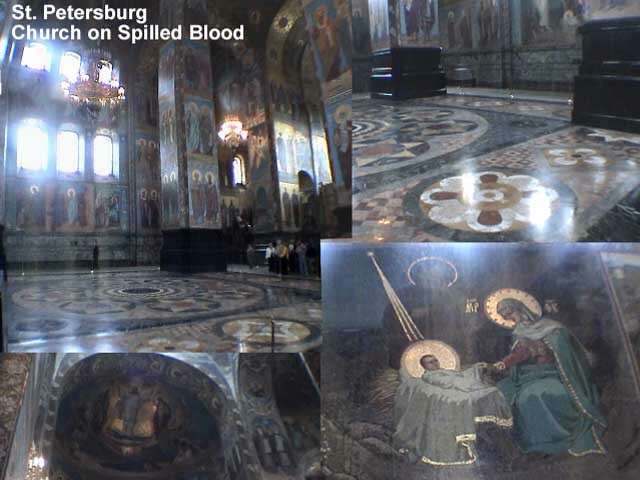 It got its former name because the church was built on the exact site where Tsar Alexander II was assassinated by a nihilist’s bomb on March 1, 1881. 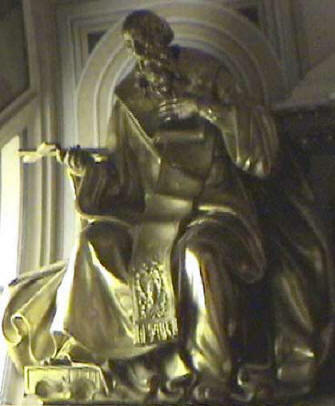 The church was modeled after St. Basil in Moscow and is spectacular both outside and inside, even if the inside was a little sterile. 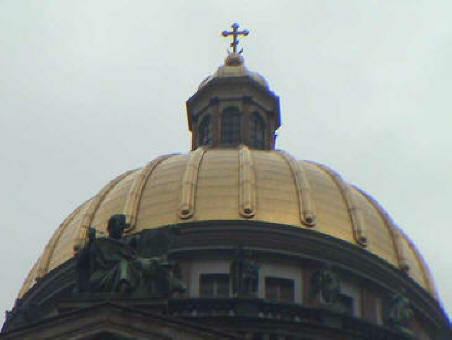 The top spire steeple is 265 ft (81 m) high and the surfaces of the five domes (11,000 ft2; 1,022 m2) are completely covered with Jewelers’ enamel. It took 25 years to complete and reopened in 1998 after 20 years of restoration. No cameras were allowed but I was able to get a few good shots, as you can see. After we left there, Polina helped us transfer money into Russian rubles and they are as beautiful as the currency we saw in Scandinavia. She also helped us get Russian cell phone cards from Megafon that allowed us to use our phones here. 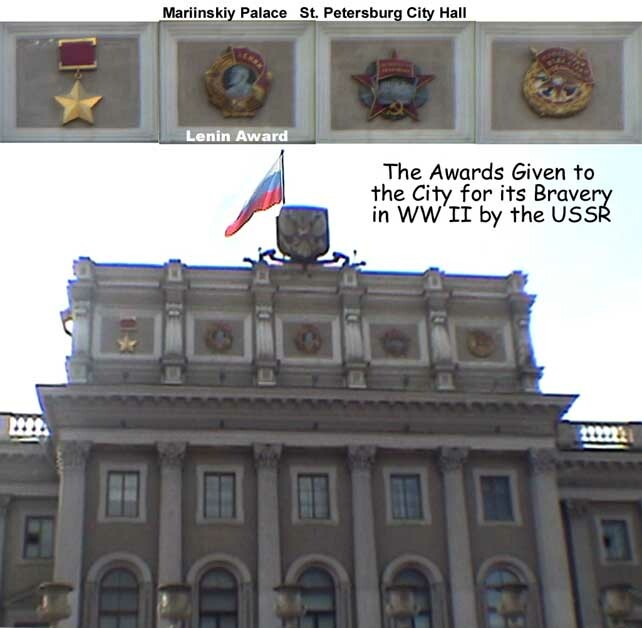 By 11:00 AM, Polina dropped me back at the Angleterre and I decided to take some pictures of the nearby St Isaac’s Square and photograph the City Hall with its awards from the Soviet government emblazoned on its front. Several contained the image of Lenin and they were bestowed on the city for the heroism of defending the city against the Nazis during WWII. 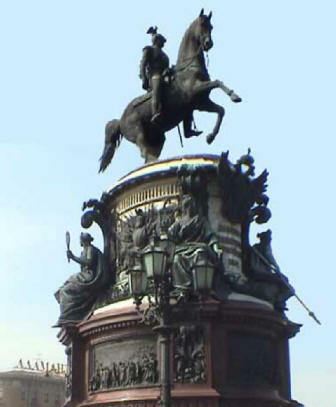 In the center of the plaza was the equestrian statue of Tsar Nicholas I (below left.) On the right is a collage of all that I saw. 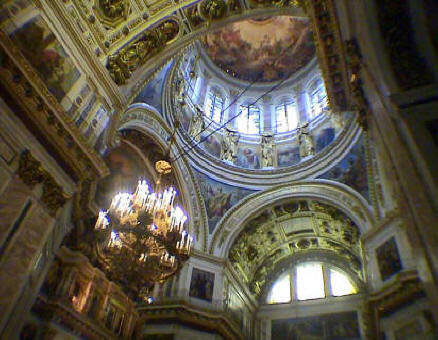 I then walked over to tour the huge St. Isaac’s Cathedral (Isaakievskij sobor) which is right next door to our hotel. It was a little difficult with the loads of tour bus groups going through. 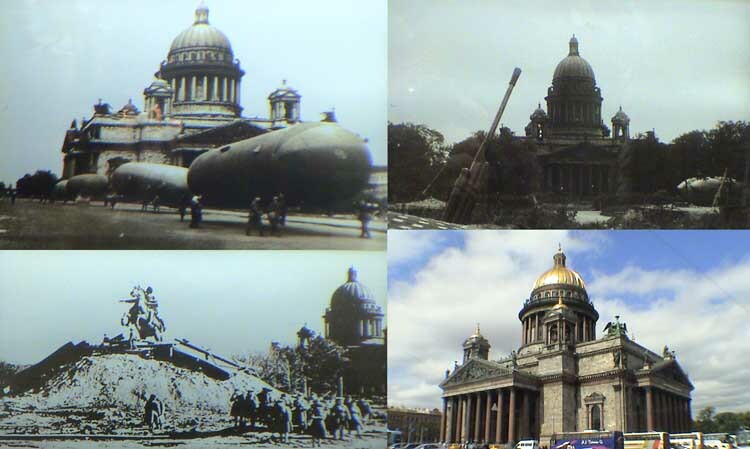 The photos of the devastation of the cathedral during WWII (above) were very interesting. 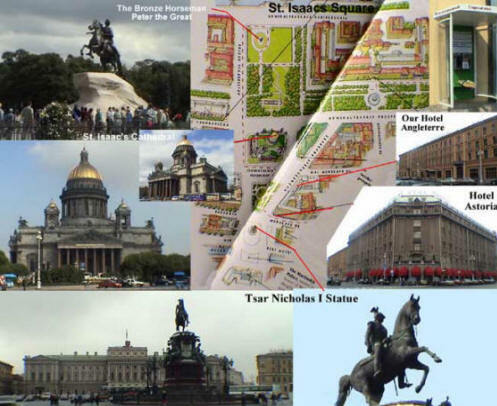 The Cathedral was built by a Frenchman (Auguste de Montferrand) to commemorate the 1812 victory over Napoleon. 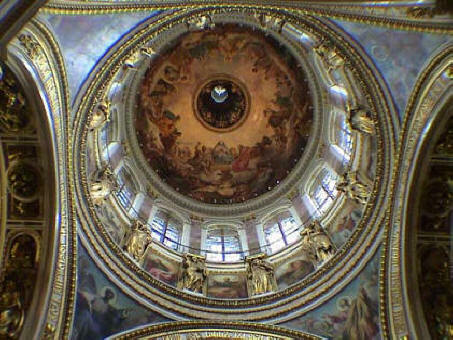 The dome above left (covered by 250 lbs (114 Kg) of gold leaf 150 years ago) and the interior were quite beautiful and the religious icons were very special. 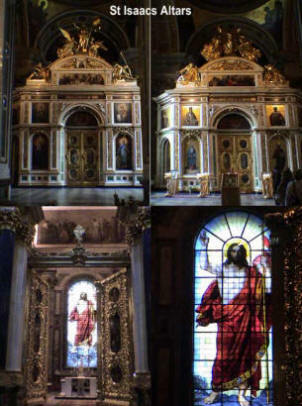 The interior was huge and the walls and altars were also quite spectacular as were the exterior doors, overhead motifs and dome ceiling. 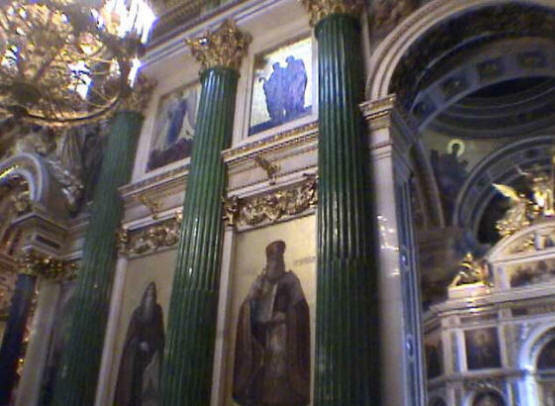 I finally found and photographed the Tomb of St. Isaac ¯. 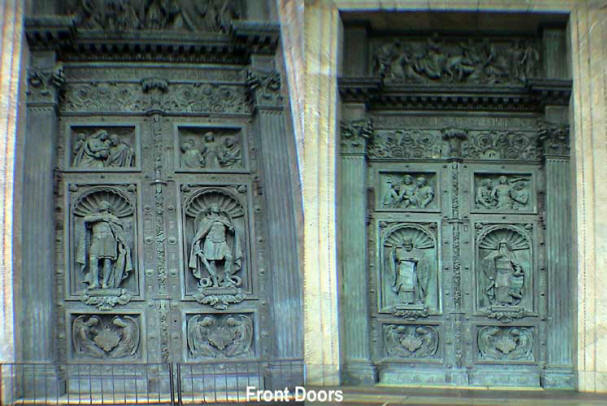 Above are the doors to the Cathedral. 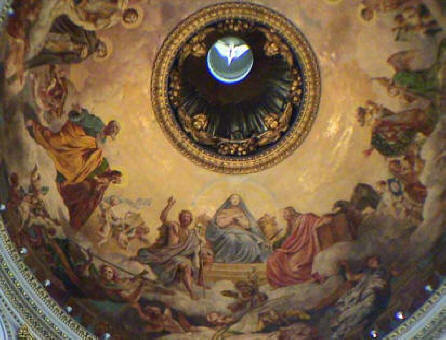 Below is the motif above them. I was done at noon and walked over to the Astoria Hotel bar and had a cappuccino and worked on video/pix for an hour and then went up and did part of my run on the treadmill and then finished it in the streets outside. I decided I had to stop being so paranoid and protected and get out amongst the people. It rained a little but the sun was shining and it was really beautiful. 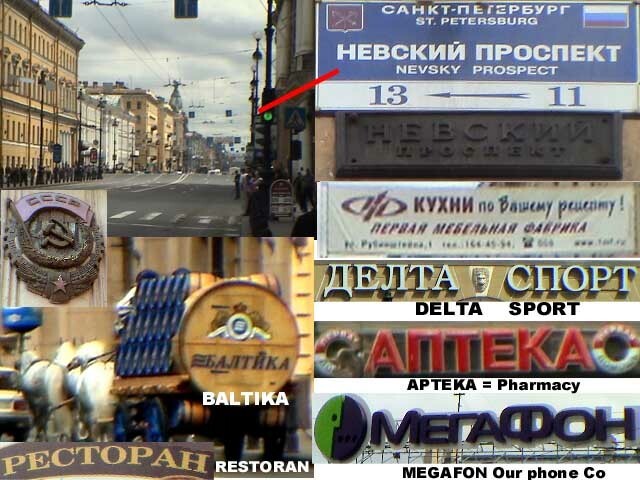 I ran to the beginning of Nevsky Prospekt which is the main street of the city. It was interesting to see a team of white “Budweiser-like” horses pulling a large cask of Baltika [БAЛTНKA] beer down the street (above left.) I’ve learned a little about the Russian Cyrillic alphabet since I have been here. It was invented by a 9th Century monk named Cyril. Here are the letters: A Б В Г Д Е Ё Ж З И К Л М Н О П Р С Т У Ф Х Ц Ч Ш Щ Ђ Ы Э Ю Я plus these extra ones: І Ї Ј Љ Њ Ћ Ў Џ б Є Ѕ Ќ Ѓ. You can see that there are several Western letters (A, E, O, K, T, M) that are pronounced like we do, but some are not pronounced the same such as the P which has an R sound, the C is pronounced like an S, B like a V, and Y is U. On my own, I figured out that the Pi (П л) is pronounced as a P, the Lambda (Л л) is said like an L, the Gamma (Г г) is said like a hard G, the Delta (Д д = Δ) is a D and the Phi (Ф ф) is an F. Then there are even stranger things such as the H is pronounced like an N, the backwards N (И) is the vowel I, the three (З) is a Z, the backwards R (Я) is YA, the Ж is ZHE, the little B (Б cap, б small) is the real letter B, and the upside down backwards h (Ч) is CH. Thus the word for restaurant, “pectopah” is ПЕCTOПAH (R-E-S-T-O-R-A-N not P-E-C-T-O-P-A-H) and Post Office (Glavpochtamt) is ГЛAВПOЧTAMT. See how easy it is once you get the hang of it. It’s like doing a cryptogram while you are trying to find a street or pectopah. The word for bridge is most, garden is sad and street is ulitsa.